Summary: The radiographic findings of two patients (one, a rare survivor) with meningoencephalitis caused by Balamuthia mandrillaris are presented with pathologic correlation. Recently, Balamuthia meningoencephalitis, a usually fatal infection caused by the ubiquitous free-living ameba Balamuthia mandrillaris, has been reported worldwide in both immunosuppressed and immunocompetent hosts (1–9). To our knowledge, imaging findings have not been reported. The radiographic findings of two patients with Balamuthia infection (one, a rare survivor) are presented with pathologic correlation. A 5-year-old immunocompetent girl had a grand-mal seizure at presentation. Features of her past medical history were normal, the patient had not traveled out of her home state, and her immunizations were current. MR images revealed two lesions, one in the left anterior temporal lobe and one in the left parietal lobe. Both lesions had a limited mass effect; increased signal intensity on long-TR images (Fig 1A); decreased signal intensity on T1-weighted images consistent with brain edema; and only patchy, irregular enhancement (Fig 1B). Repeat MR images obtained 11 days later revealed increased, but still mild, mass effect, and more ringlike peripheral enhancement (Fig 1C). However, no evidence of a peripheral ring was seen on nonenhanced T1- or T2-weighted images (Fig 1D). Image-guided brain biopsy revealed a necrotic cortex, no organisms, and a ghostly outline of perivascular monocytes, which raised the possibility of amebic infection. A specimen was sent to the communicable disease center where immunofluorescent studies resulted in the diagnosis of Balamuthia mandrillaris encephalitis. Repeat MR imaging performed 10 weeks after the patient’s presentation clearly revealed a ring at the periphery of the lesions, hyperintensity on T1-weighted images, and hypointensity on T2-weighted images (Fig 1E). Also, a 3-mm-thick ring of gadolinium enhancement was noted. The mass effect was markedly increased at this time (Fig 1F). Restricted diffusion in the center of both lesions was noted (Fig 1G). Internal, nonenhancing debris appeared to be present in both lesions. The patient was treated with multiple antiamebic drugs for 16 months. As of the writing of this article, no new lesions or further symptoms developed, and the patient was asymptomatic. Follow-up MR images obtained 16 months after presentation (not shown) revealed that the parietal lesion was unchanged in size and that the temporal lesion was 1 cm smaller. Ring enhancement was still present, but it was reduced. The peripheral rings were still evident on nonenhanced T1- and T2-weighted images. Surrounding encephalomalacia was noted. Diffusion-weighted images now revealed increased water diffusion in the lesion. A 32-year-old HIV-negative man with a history of alcohol and drug abuse presented with signs of elevated intracranial pressure. MR images revealed a 3-cm enhancing left temporal lobe lesion (Fig 2A). On nonenhanced images (not shown), the rim was not visible. Two other small lesions were noted in the left thalamus and left frontal gray matter–white matter junction. The patient had a rapidly worsening course, and MR images obtained a week later revealed more than 50 enhancing lesions throughout the brain (Fig 2B). Examination of the CSF had revealed a cell count of 220 per mm3 (44% neutrophils and 56% monocytes, 160 mg/dL protein, and 37 mg/dL glucose. Image-guided brain biopsy revealed prominent coagulative necrosis and perivascular chronic inflammatory cells. No bacterial, fungal, or parasitic elements were identified with special stains. Culture findings were negative. On the 25th hospital day, a large hemorrhage (not shown) was noted; it was confined to the original left temporal lesion. The patient died on the 35th hospital day. 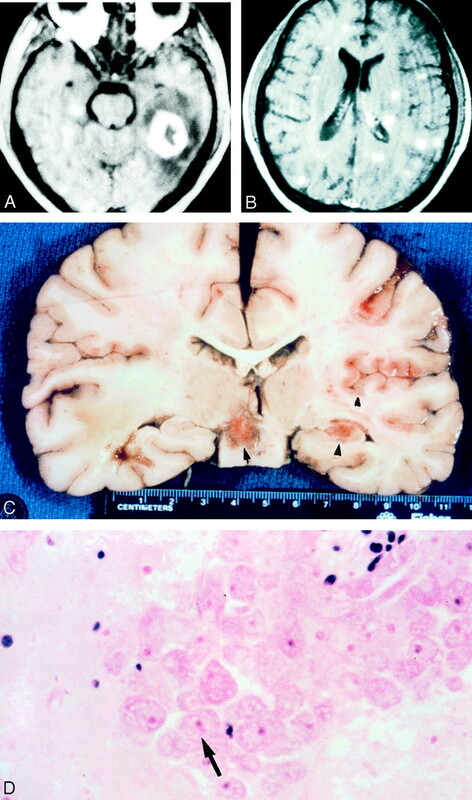 Postmortem examination revealed diffuse cerebral edema with multiple hemorrhagic and necrotic lesions in the cortex, brain stem, and cerebellum (Fig 2C). Microscopic examination revealed purulent exudate overlying cortical necrosis, neutrophils, and mononuclear inflammatory cells in the subpial and perivascular spaces (Fig 2D). Uninucleated amebic trophozoites and cysts were identified in the perivascular spaces in the necrotic areas of the brain. The amebae were immunoreactive with rabbit serum with antibodies for Balamuthia mandrillaris. Balamuthia mandrillaris (previously known as Leptomyxid ameba) was first identified as a pathogen when it was isolated from the brain of a baboon at the San Diego Zoo. Free-living ameba are ubiquitous; that is, they are found in fresh or frozen vegetables, heating and air conditioning units, dental and surgical instruments, dialysis units, contact lens solutions, and fresh and salt water. The ameba is responsible for sporadic meningoencephalitis, with mortality rates near 100%. About 200 cases have been reported worldwide. Balamuthia ameba spread hematogeneously from a cutaneous, ocular, or pulmonary lesion to the CNS, where vasculitis dominates the clinical picture. Many patients are immunocompromised, but some are immunocompetent. Previous reports of Balamuthia infection in the medical literature do not mention imaging findings. Many, but not all, reports are from countries where modern imaging equipment is unavailable. Our first patient had only two lesions, both large 3–4-cm ring-enhancing lesions involving both gray matter and white matter and extending to the surface of the brain. Only very patchy enhancement and minimal mass effect was seen acutely; this finding was consistent with encephalitis. Although no capsule was seen on T1- or T2-weighted images until 10 weeks after presentation, mild ring enhancement was seen at 11 days, and this finding was consistent with a host immune response. Mass effect and ring enhancement were maximal at 10 weeks. The central part of the lesion had restricted diffusion at this time. Restricted diffusion in bacterial cerebral abscesses is an expected finding, and it has been ascribed to the high cellularity and viscosity of pus (10, 11). A CT scan obtained at 13 weeks showed that the rims of both lesions were calcified. Calcification was seen within the capsule as well. At this time, the mass effect was no longer present, and encephalomalacic changes surrounded the lesions. However, contrast enhancement in the periphery of the lesion was still seen (it persisted, although it was less intense) when the patient underwent MR imaging months later (images not shown). The low-signal-intensity capsule depicted on T2-weighted images usually resolves in 4–6 months, and the resolution and disappearance of a capsule is believed to be a reliable sign of healing (12). In our surviving patient, however, ring enhancement and persistence of the low-signal-intensity capsule persisted 16 months after diagnosis despite treatment with multiple antiamebic agents, considerable calcification of the periphery and center of the lesion, resolution of the mass effect, and signs of encephalomalacia. Although the patient is asymptomatic, presumably active infection persists, as shown by the capsule on nonenhanced MR images and the ring enhancement. However, containment of the infection is suggested by the calcified rim on CT scans and by the increased diffusion within the lesion that is most consistent with necrosis. This patient is a very rare survivor of Balamuthia brain infection. The second patient presented with a large 3-cm temporal ring-enhancing lesion with surrounding vasogenic edema and a regional mass effect. The ring enhancement was more than 1 cm thick. Two additional lesions, both 1 cm and homogeneously enhancing, were seen in the left thalamus and frontal cortical gray matter–white matter junction. 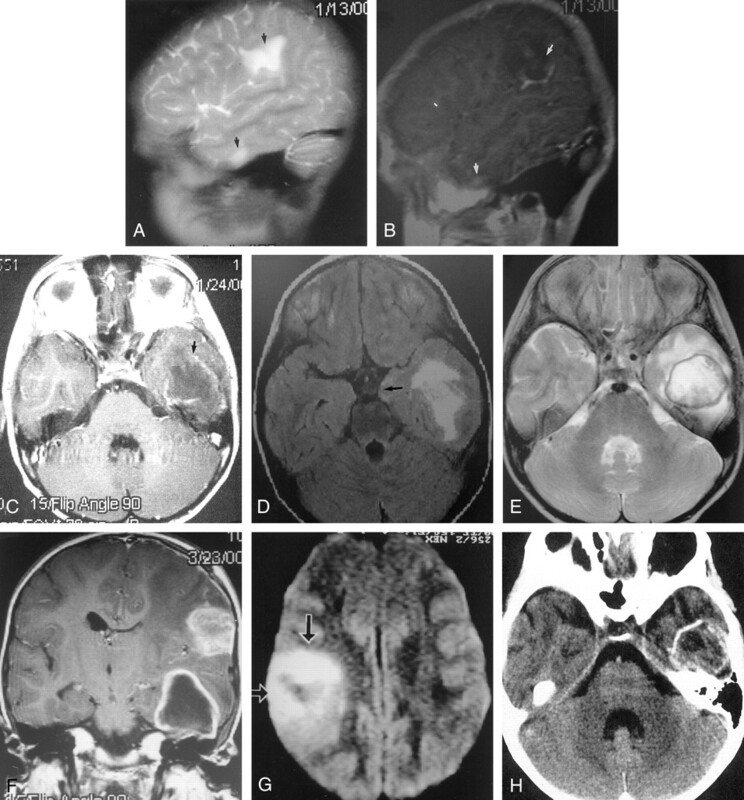 In this patient, Balamuthia meningoencephalitis was overwhelming, and a hypoattenuating rim did not form around either the primary lesion or the dozens of newer homogeneously enhancing lesions. Only the original presenting lesion had ring enhancement, the result of an apparent effort to wall off the lesion. Dozens of other lesions had solid enhancement that was most consistent with cerebritis. Within a week, this patient had more than 50 homogeneously enhancing lesions with little or no surrounding edema or mass effect. Fewer than half of these lesions were seen on nonenhanced MR images, and many involved gray matter. On the 25th hospital day, CT images (not shown) revealed hemorrhage in the original large ring-enhancing lesion. Hemorrhage in an abscess that has previously been evaluated at biopsy is not unusual (12). Further MR imaging was not performed. The patient died 35 days after the onset of symptoms. Pathologic slides revealed perivascular clustering of amebic trophozoites in this patient, and pathologic reports in the literature emphasize angiitis and focal hemorrhages, which are typical findings in Balamuthia infections. When purulent CSF is obtained and when no bacteria are noted in a patient with meningoencephalitis, the CSF should be examined specifically for amoeba, as well as other organisms. Specific antibodies to Balamuthia are available from the Centers for Disease Control and Prevention. The author would like to thank Lawrence Hanson, MD of the University of California, San Diego, Department of Neuropathology for his assistance. Presented at the ASNR 39th Annual Meeting, Boston, Massachusetts, April 2001.